We have been building Rifle Scabbards for years and have learned to design scabbards that are functional, good looking and durable. The TrailMax™ Guardian Rifle Scabbard completely encloses most scoped sporting rifles. Encased in high density, waterproof foam and shielded by a tough 600 denier pvc-coated polyester shell, you can be sure that your gun is well protected. Measuring 54 inches long and 12½ inches wide at the flap, the TrailMax™ Guardian Rifle Scabbard accommodates up to a 30 inch barrel and a 56mm scope. 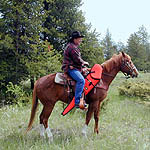 The flap is designed for either maximum protection with a zipper closure or for quick access with a side release buckle. Heavy-duty straps allow you to secure the TrailMax™ Guardian Rifle Scabbard to any saddle or ATV. Inside the scabbard flap, we have included a drying towel to help you maintain your expensive equipment. Ammunition and other necessities can be carried in a handy outside pocket. The TrailMax™ Guardian Rifle Scabbard is designed to accommodate both left-hand and right-hand bolt action rifles. The standard TrailMax™ Rifle Scabbard is made from 600 denier, PVC coated polyestern and lined with felt. It measures 43 inches long and 11 inches wide at the flap and features a built-in cartridge pocket and heavy-duty straps. The TrailMax™ Rifle Scabbard can be hung from either side of the saddle and is available in left-hand or right-hand bolt action. For a truly traditional look and feel when you are out hunting, nothing beats a Leather Rifle Scabbard. We make our Leather Rifle Scabbard from beautiful, premium quality, US-tanned leather. In time honored tradition, each piece of leather is hand picked, stitched and hand finished. Our Leather Rifle Scabbard is pre-molded to fit a scoped sporting rifle, thus eliminating the need for you to force your gun inside the scabbard. The scope area is lined with wool shearling fleece to protect your expensive equipment. 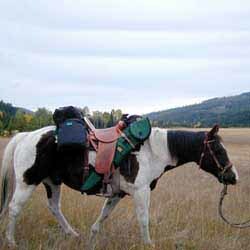 It has a push button snap closure on the flap and two straps for attachment to your saddle and is designed in both left-hand and right-hand bolt action. It measures 10 inches wide at the flap and 43 inches long and will accommodate up to a 26 inch barrel and up to a 56mm scope. The attachment straps are at least 52 inches long. Complete, our Leather Rifle Scabbard weighs 4 pounds.